Washington Old Hall is a historic Grade-I listed 17th-century manor house associated with the ancestors of the first US President, George Washington. The Old Hall is one of the smallest properties in the care of the National Trust. The interior of the manor features objects connected to America and the War of Independence in which George Washington played such a pivotal role. 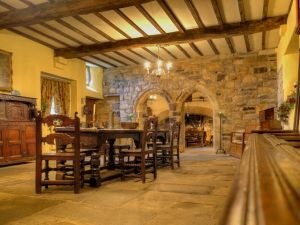 The major rooms include the original 17th-century kitchen and a large Great Hall, the centre of manor life. The interior features a collection of old oil paintings, porcelain, and historic oak furniture. The manor is set in attractive gardens and meadows that provide a habitat for old varieties of English wildflowers. There is also a Nuttery; a nut orchard which is home to lovely wildflowers in season. Washington Old Manor incorporates bits of the medieval hall which was home to George Washington's forebears, and from which the Washington family took its name. The house stands two storeys high and is built of coursed sandstone with a pantiled roof. The Hall hosts an annual 4th of July Independence Day celebration. Location: Signposted from the A1231, from junction 64 of the A1.